Our Brooklyn bands cramming for their “final” on the last day of classes, one day before the show. Yet another semester is underway in Brooklyn and Paris and we couldn’t be more excited! Stay tuned for some awesome covers, amazing original songs and some inspiring projects connecting our two programs across the ocean! Lots of fun things in the works over the next few months…. Julian and Max seem keen to be back. A dangerous rhythm section…don’t let the smiles fool you! "Our 9 year-old son has loved both the PSRS summer camp and the school-year program. It is amazing to see young musicians play cover songs and compose original music that is often exceptionally good. The teachers are wonderful role models for the budding musician, or the child who is already advanced. Our son has grown musically under the influence of different teachers, and has had a blast in the process." And congrats to Kate for a glowing review in the New York Times for her latest children’s book, Infinity and Me! Check out the review HERE. PSRS was very sad to hear that Southpaw, one of Brooklyn’s premiere rock clubs, was closing its doors for good. Mikey and the crew at Southpaw hosted two of our final concerts for PSRS and we had a blast. Gentrification can be a drag. 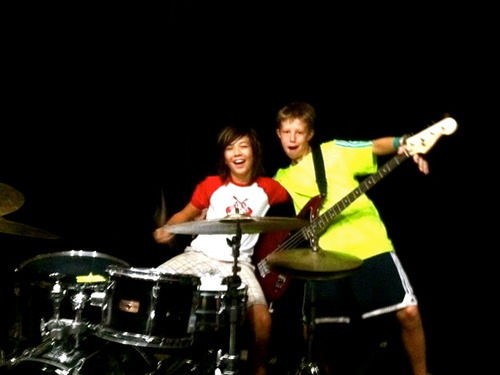 Check out a video below of one of our bands playing the stage in 2009. RIP!